Y’all, there are a few mysteries of ready to wear clothing that I just can’t solve. Like, why can I find bras and underwear that fit but not swimsuits? Or why do all the cute shoes start at a size 6 when I wear a 5? Or, why do jeans always gap at the back waist? Well, that last one at least, I can help with, because I know I’m not alone with the back waist gap. 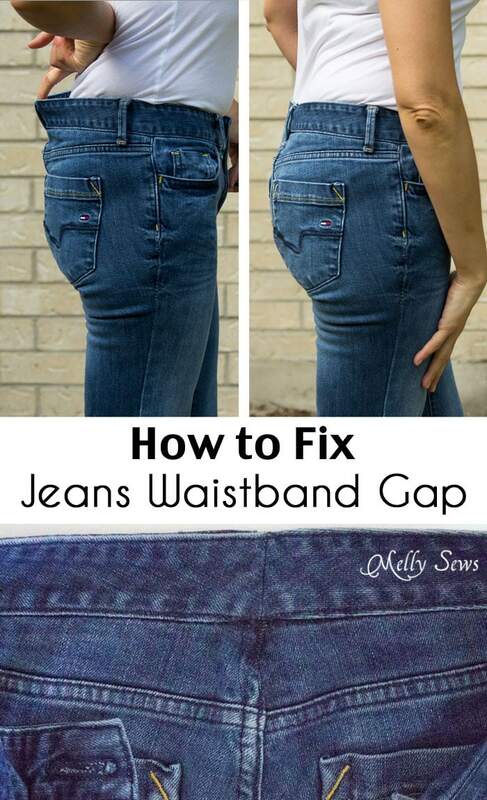 So today let’s talk about how to fix jeans waistband gap. 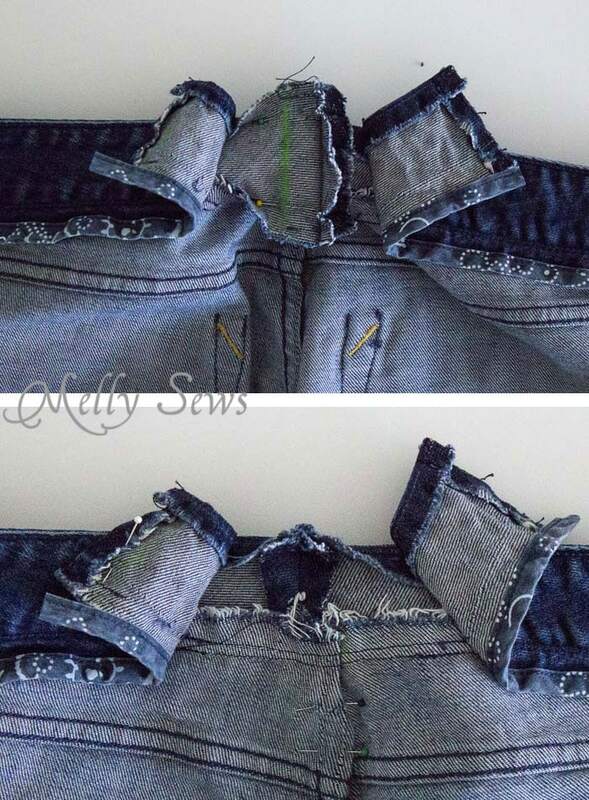 To fix this, you need to start by trying on your jeans and figuring out how much you need to take out of the waistband. Mark it with chalk or pinch it out and measure it, but have a rough idea of what you need to do. 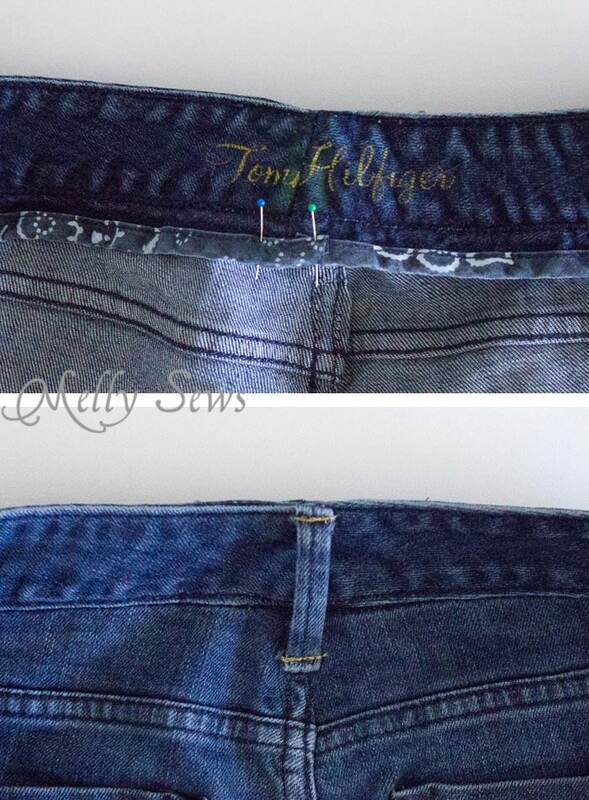 And if your gap is less than 1/2 inch on each side and your jeans don’t have a center back waistband seam, this is going to be hard to do. I’d suggest just wearing a belt in that case. But if your gap 1/2 inch on each side or bigger, read on. Then, grab your seam ripper. You need to rip the belt loop stitches and set the loop aside, then rip waistband and waistband lining stitches for several inches to either side of the center back, as well as the center back yoke seam. There are a LOT of stitches here, because most waistbands are sewn and topstitched, and most back yokes are flat felled. Be patient. Once you’re done ripping, if your waistband doesn’t have a center back seam, cut the waistband at center back. This is a good time to try your pants on again inside out and pinch out the back waistband gap then pin and mark it. Next, cut a wedge out of your back yoke. Keep it the same width at the bottom of the yoke, and cut in 1/2 your gap amount at the top REMEMBERING TO LEAVE SEAM ALLOWANCES. Don’t mistakenly cut right on your mark. Refold the center yoke seam to flat fell it. Not sure how flat felling works? See this post. 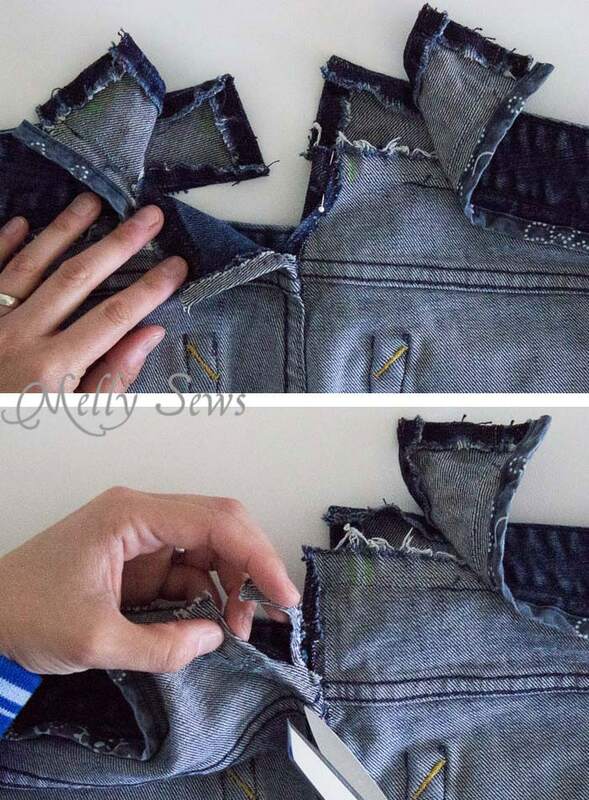 Pin the back yoke seam and then sew it in place, using thread that matches your denim here. Sometimes this seam can get kind of wonky, so it’s best to leave the topstitching for later. Next, pin the waistband to take out your gap. 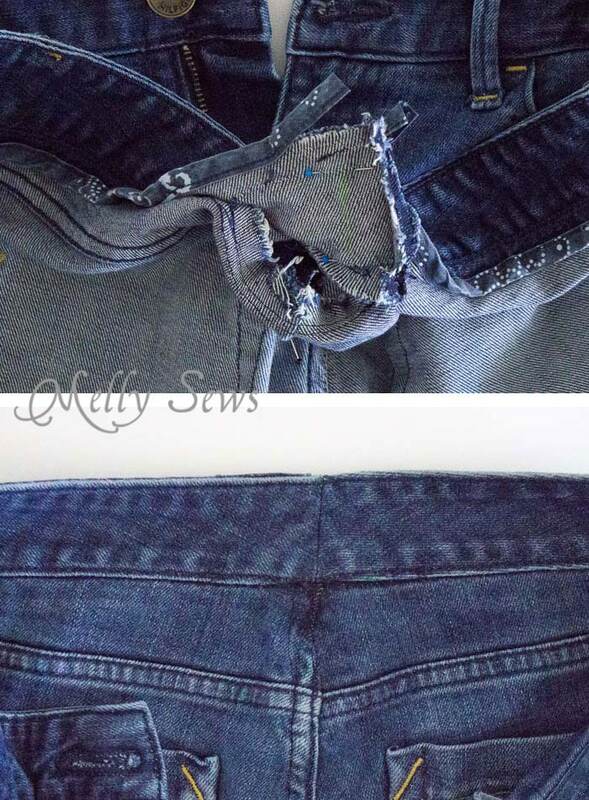 I prefer to sew this seam and try my jeans on again before cutting down the seam allowances and pressing the seam open. Once the center back seam is sewn, you can sew the waistband back onto the pants, sewing on the original seam line. Now flip your waistband lining so you can pin it right sides together and sew it together so it will match the new waistband. Load your machine up with topstitching thread. Topstitch the new yoke seam and the top and bottom of the waistband to the waistband lining. You may want to use a rubber mallet to hammer your seams flat before topstitching. It may sound crazy but it really helps. 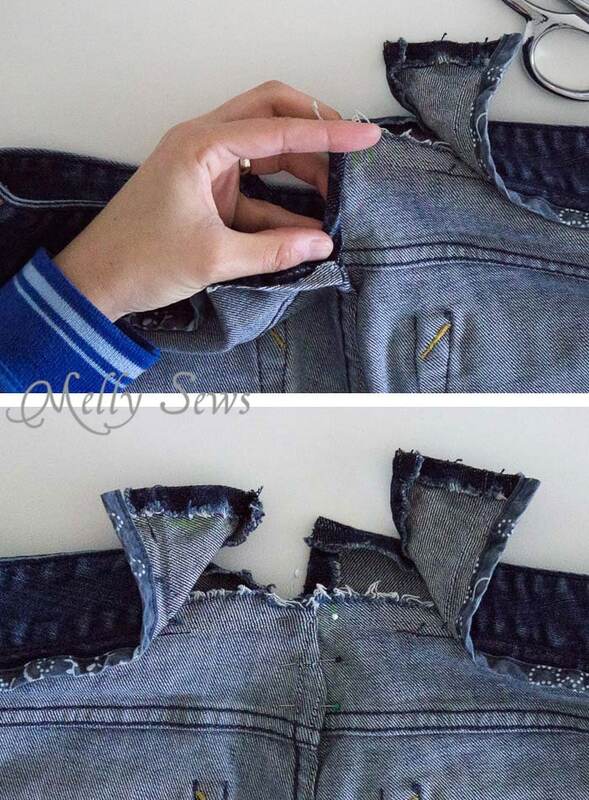 More tips for sewing denim here. On the inside, if your waistband lining had bias trim like mine did, overlap that and stitch it back into place. Finally, sew the belt loop back on (see how nicely it covers that center back seam?) and you’re done! 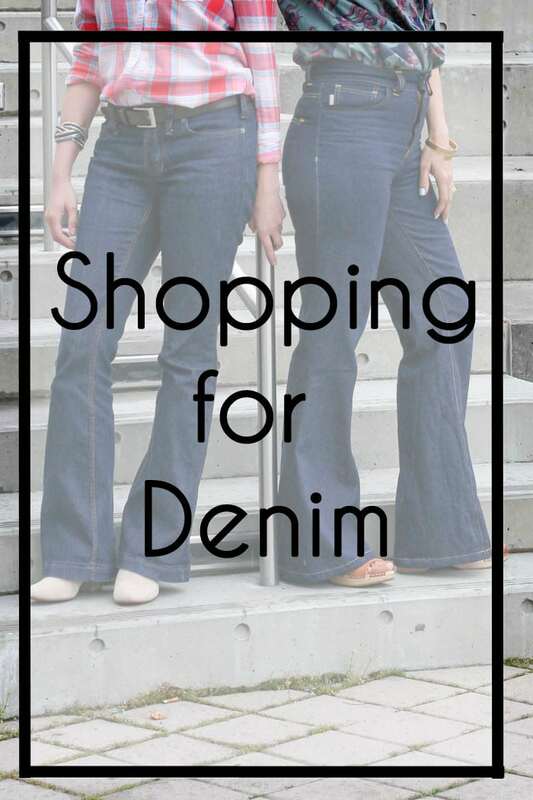 Don’t forget to hop over to Sabra’s blog today and check out her guide to shopping for denim. Thank you! Constantly have this problem with jeans! Also, know your frustration with shoes…wear a Size 5 too!!!! A good alternative to a seamstress. Thanks. I’ve just been putting darts in mine, but this is an elegant solution. Thank you for sharing! Thank you so much for this. Nothing fits on the waist if it fits on the hips but this is the perfect solution. I altered a pair of shorts which are new, but you know how it goes – perfect fit in the shop then stretch and stretch and stretch as you wear them! They are great now and don’t look as though I am wearing my mum’s clothes.